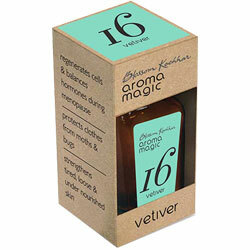 Aromamagic Vetiver Oil - Regenerates cells & balances hormones during menopaus, strengthens tired, loose & under nourished skin. Strengthens tired, loose and under nourished skin. Regenerates cells and balances hormones during menopause. Protects clothes from moths and bugs.